Where Roots And Wings Entwine: Notcutts warm white LED cone lights review. Notcutts warm white LED cone lights review. When it comes to Christmas decorations I am a sucker for decorations that sparkle, twinkle and shimmer. During the festive season I love snuggling up on the sofa with the fire roaring in the background with all the lights off so that the house is dark expect for the twinkle and glow that emanates from Christmas and fairy lights that are scattered around the room and adorn the Christmas tree. As I love twinkly lights and get mesmerized by their glimmering glow I could not resist the offer of reviewing some Christmas lights from Notcutts. 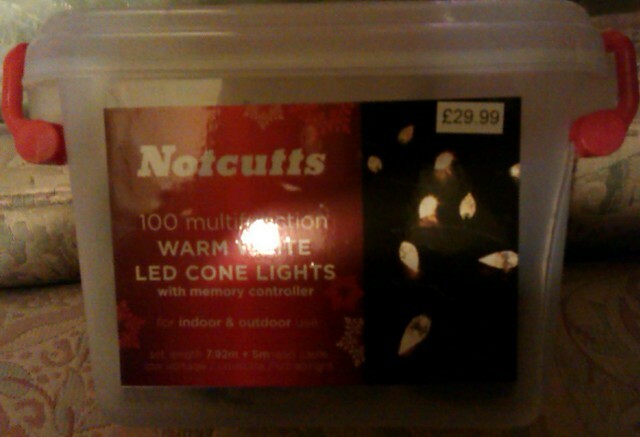 Notcutts sent us a set of 100 warm white LED cone lights to help decorate our home during the festive season. The Christmas lights arrived in a plastic box and I am not ashamed to say I love the box; it is a strong and sturdy box can be reused to store the lights in over the month’s in-between Christmases. The handy box means that another set of Christmas lights will not end up intertwined with other sets when abandoned in the bottom of the Christmas decorations box as they will be housed in their own little home once Christmas has been and gone for another year, patiently waiting until they are called up for duty again to proudly twinkle and glow. The warm white LED cone lights are versatile as they can be used both indoors and outdoors. I could not resist bathing in the twinkly glow of the lights so we opted to use them indoors and attempt to revive our tatty Christmas tree by giving it a festive twinkly make-over. The lights are on approximately 8 metres of cable which in my opinion is ample to decorate most Christmas trees, windows or to embellish outside in a festive glow. As well as appreciating the generous length of cable bejewelled with LED cone lights I also like the fact that these lights have a 5 metre power lead cable which provides an ample amount of cable for the lights be plugged in. I also like the fact that the cable is green in colour which allows the cable to blend in with the Christmas tree. These Christmas lights are shaped like cones and have been beautifully made with each individual cone being etched and formed to be reminiscent of real pine cones with the textured detailing signifying the scales found on cones. I love the cone shape which is perfect for Christmas as cones are often associated with the festive season and think they make for an interesting and different style compared to standard Christmas lights. The cones look beautiful and are proudly adorning our Christmas tree, with the cone style effectively highlighting the festive season. The lights produce a warm twinkling, glow and since having the lights we have spent a few nights snuggled in the dark enjoying a Christmassy film with the beautiful twinkly lights helping to create a relaxed, Christmassy atmosphere. I like the range of settings available and it is great to be able to change the lights’ settings to create different atmospheres and to make the lights more interesting and eye-catching. 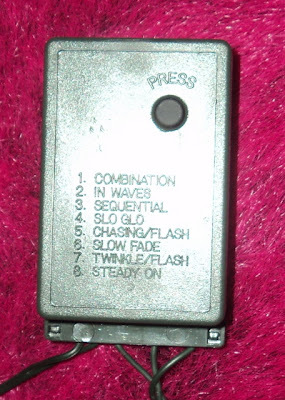 It is easy to change between the settings by simply pressing the button and I like the fact that the memory controller remembers your chosen setting so that when the lights are plugged in and switched on again after being unplugged the controller automatically sets the lights on the previous setting. Little man love the Chasing/Flash setting in particular with him being fascinated by the lights chasing each other in quick succession. 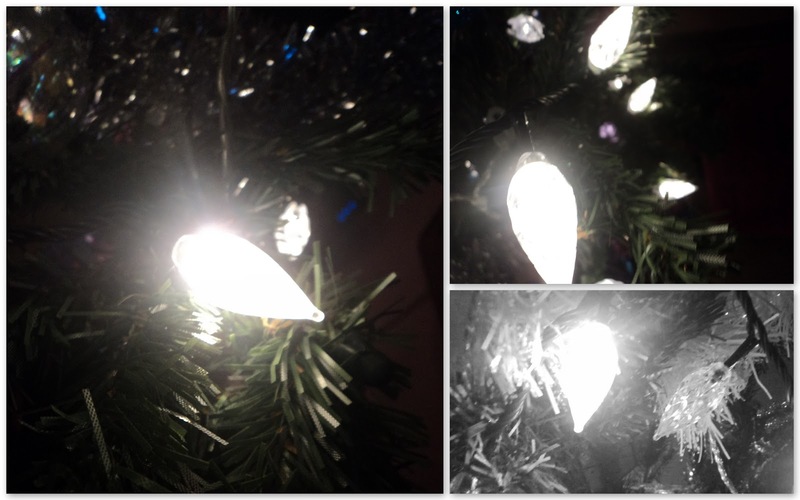 I am very impressed with these lights especially as they twinkle beautifully. The only slight imperfection I can find with these lights is that it appears that the bulbs are non-replaceable which I think is a shame because when a few of the bulbs no longer work it would ruin the different effects and the overall sparkling effect the lights produce. Hopefully, especially as the cones look durable, the bulbs will last well and this will not be a problem for a long time or that I am mistaken and the bulbs can be replaced if they are not working (I will be happy to be proven wrong about my assumption that the bulbs cannot be replaced). The warm white LED cone lights have an RRP of £29.99 which is think is a respectable price for good quality, interesting lights but are currently being sold on the Notcutts website for an even better price of £14.99 which I think is exceptional value for money. As well as selling these Christmas lights, Notcutts have an extensive and very tempting range of Christmas products available to buy either online on the Christmas section of their website or in the 19 garden centres they have across the UK. Not only do Notcutts sell a range of Christmassy goodies to help you ‘deck the halls’ they also sell a range of other products and are renowned for the quality gardening products. I have been tempted by many of the products they sell especially the Christmassy products…. 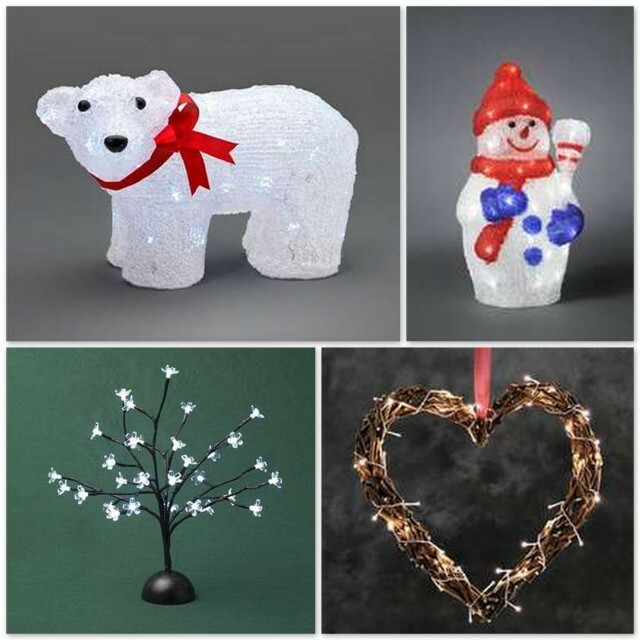 I love the LED White Cherry Tree and the Pre Lit Natural Twig Heart (both of which would satisfy my love of twinkle and look beautiful any time of year) and I have fallen in love with the adorably cute LED Acrylic Polar Bear and the LED Acrylic Snowman. For more information about Notcutts.